WEMBLEY STADIUM 1989. SIMPLE MINDS. CONCERT TICKET. 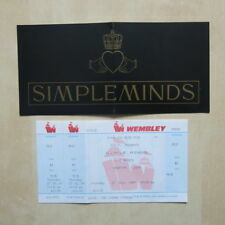 SIMPLE MINDS TICKET FROM WEMBLEY STADIUM. HELD ON THE 22nd AUGUST 1991. Simple Minds - Cardiff Arena 1995 Concert Ticket Stub. Condition is Good. Dispatched with Royal Mail 2nd Class Letter. Unused 27/7/1989 Wembley Studium Ticket and unused After Party Guest Ticket. SIMPLE MINDS. CONDITION: Excellent [Afterparty ticket has been folded]. At Parade Records we pride ourselves on providing high quality vinyl/CDs, and a friendly and professional service. Cover in good condition as always kept in protector. Simple Minds - Birmingham NEC 1989 Concert Ticket Stub. Condition is Acceptable. Dispatched with Royal Mail 2nd Class Letter. Please check photo as ticket has some fading. New listingsimple minds / All About Eve roundhay park leeds, low numbers, ticket 10 & 11!! Low numbers,old ticket stubs, simple minds with all about eve as support. SIMPLE MINDS - Street Fighting Years- ticket stub Wembley Stadium 1989. Condition is Very Good. Dispatched with Royal Mail 2nd Class. Simple Minds Original programme and ticket Cardiff Arms Park 5th August 1989. 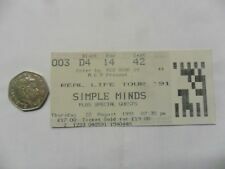 SIMPLE MINDS NOTTINGHAM ROCK CITY TICKET FEB 7 2006 - - UK Condition is EXCELLENT. Dance, Disco, Rap, House. Punk, New Wave, Mod, Ska. Progressive Rock and Folk. Rock /classic rock. Rock of ages. 70's Glam Rock. Artist : Simple Minds Venue : Hammersmith Odeon, London Date : Friday, 25th September 1981 Additional Info : White Stalls Ticket Block 22 Row H Seat 42 Condition : Very Good. Some light creasing across the ticket. Please refer to photo. Postage discount for multiple purchases. I have added many more original concert tickets that are now for sale on the fincharie website. Please visit and follow the link. Please check out the fincharie website for many other Beatles, Rolling Stones, Pink Floyd, Cream, Eric Clapton, Paul Weller, and many other artists memorabilia items from the 60's to the current day that are now up for sale. Thanks for looking and happy bidding. X2 ticket stubs. SIMPLE MINDS. REAL LIVE TOUR. and i will always do my best to sort out any problem. and let's sort it out it all out. x1 parking ticket. hands of a third party. Artists : Simple Minds Venue : Alive & Kicking Tour 2003 Date : 1st December 2003 - 20th December 2003 Additional info : Original colour Handbill Flyer measures 8 1/4” x 5 7/8”. Condition : Excellent. Please refer to photo. I have added many more original concert tickets that are now for sale on the fincharie website. Please visit and follow the link. Please check out the fincharie website for many other Beatles, Rolling Stones, Pink Floyd, Cream, Eric Clapton, Paul Weller, and many other artists memorabilia items from the 60's to the current day that are now up for sale. Thanks for looking and happy bidding. Inside in very good condition (slight creasing). Eintrittskarte, Konzertkarte, Billet, Ticket, Karte, concertkarte, concertticket. ORIGINAL KONZERTKARTE. SIMPLE MINDS. TURIN - ITALY. Alle Angaben nach bestem Wissen und Gewissen. Manchester City Football Ground. 10 Aug 1991 Unused Concert Ticket. Simple Minds Real Life Tour ’91. 14.5cm x 10cm approx. Ticket Stub 1995 Academy NYC. SIMPLE MINDS. Seidboard World Enterprises. New York NY 10012. PO Box 137. June 21, 1986 - Milton Keynes Bowl, UK. Original and Rare Concert Ticket. Ticket is creased. June 7, 1986 - Ibrox Stadium, Glasgow, UK. Original and Rare Concert Ticket. Ticket is creased.